This is the Age of the Train… again? 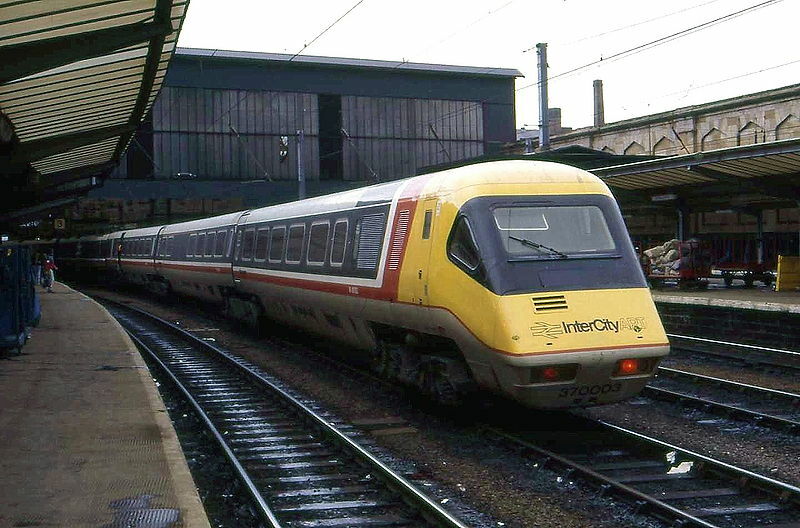 Having been interested in the railways since the mid-1970s it was with some interest I saw an article on the BBC News web site today about the replacement of the old “Inter-City 125”, or “High Speed Train”, trains with new Hitachi units. 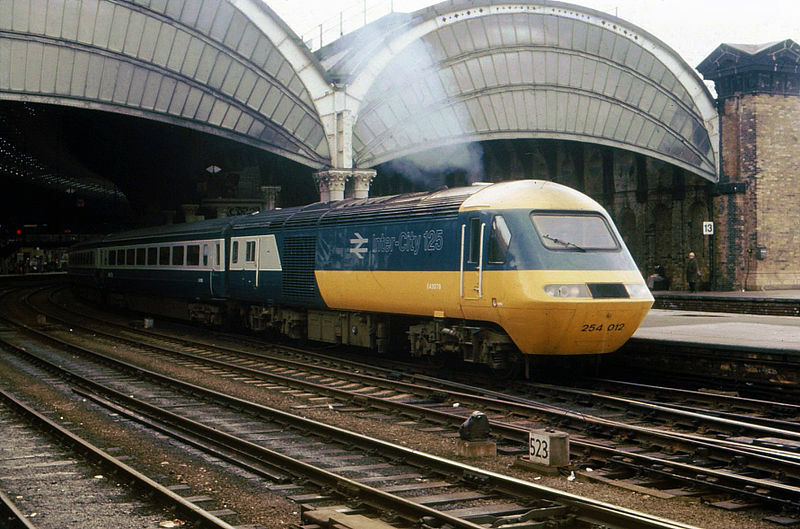 The HST, or “Inter-City 125” as it was marketed, came into service in 1977 on the Great Western Mainline between Paddington and Penzance. This was less than ten years after the last of the modernisation era diesels came into service and only a little after ten years after the West Coast Mainline had been completely upgraded and electrified. Indeed, no locomotive on the system was more than 17 years old, all freight rolling stock had been replaced, as had much of the coaches and all the local trains, except for the ones on the Southern Region’s three rail electric system. But there’s to the mistake than even these facts and to illustrate this we need to go back to the origins of the HST itself… And it’s also a good story. In the late 1960s, even after the upgrade of the West Coast Mainline to full electrification the speeds of the trains and hence the journey times hadn’t changed a great deal. Abroad in Japan you had the bullet trains and in France SNCF had been breaking records using their powerful electric locomotives (but only on specially built high-speed lines). It was seen by the British Rail Board that something needed to be done. British rail stock, even the fastest, was limited to 100mph running even on the best tracks. This was due to a combination of the network being a general purpose system running both passenger and freight traffic with a meandering track layout imposed by the Victorian builders’ whims and the wheel and suspension technology of the trains. So, it was decided to start a project for a train which could overcome all of these problems and run at 155mph. And so the Advance Passenger Train (APT) project was born. BR decided that the best way of building a new, high technology train was from the ground up. They didn’t want any legacy rail rolling stock builders trying to refine the old designs, they wanted new thinking. So, instead they brought in people from the aero industry to look at the problem from a new perspective. By 1972, after a great deal of research into wheel design, suspension systems, aerodynamics and coach tilting the first test bed train set arrived on the tracks, the APT-E (experimental). This was a combination of two power cars being powered by gas turbine engines which generated electricity to power the traction motors which turned the wheels plus a couple of “passenger” cars containing all the test equipment. Initially this ran only on the Old Dalby test track near Derby but later visited most of the rail network. The APT-E was the first actively tilting train in the world. Previous attempts at tilting trains in places such as Italy used a pendulum system but these didn’t work very well. (This is where the name “pendulino” comes from, later used for the current tilting trains on the West Coast Mainline, but more of that later…) The APT-E used hydraulic actuators to rotate the coaches so that the centre of gravity moved inwards on bends, meaning that they could be taken faster without the risk of the train toppling over. It also had the effect of minimising the sideways load on the passengers but this was not it’s primary purpose. However, even by the time the APT-E made its way onto the rails some within British Rail could see that the APT project was going to take a lot longer than first envisaged and the system needed a stop-gap. This wasn’t a universal view within the British Rail Board and it took a rogue element to start a “skunk works” project using a design team from the traditional rail rolling stock manufacturers. This was the “High Speed Train” (HST) project. 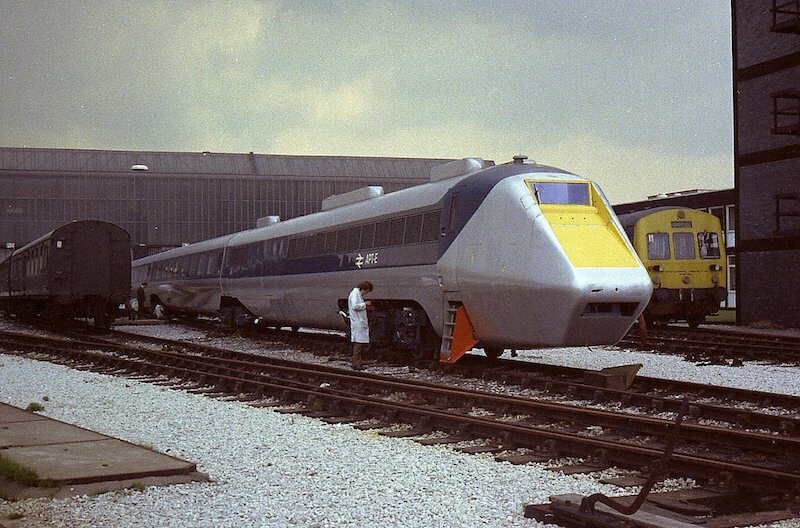 Initially, the HST project was hidden. The group took a great deal of the fruits of the early research work from the APT project and adapted them to a more traditional railway design. The most important section of the APT design they used was the bogie/suspension/axle set innovation. Previous designs had major problems with oscillating instability above 100mph causing the flanges on the wheels to start bouncing off the rails as the train went along. Not only was this dangerous but also caused massive rail and wheel wear and the forces damaged the bogie frames. The APT researchers had managed to solve these problems. The other innovations included were the use of monocoque structural design and the early aerodynamic work. By the time the British Rail Board cottoned on that they needed a stop-gap before the APT came into service there was already a prototype HST almost complete, which took to the rails in 1974/75. The main difference you will notice between this prototype, other than the natty “inverse Inter-City” colour scheme, is the cab design. This Class 252 unit has lights directly under the window and buffers. (Some of the later units had buffers retro-fitted in the 2000’s for some reason.) Other than that and a lower power output, the prototype was almost identical to the first production units. 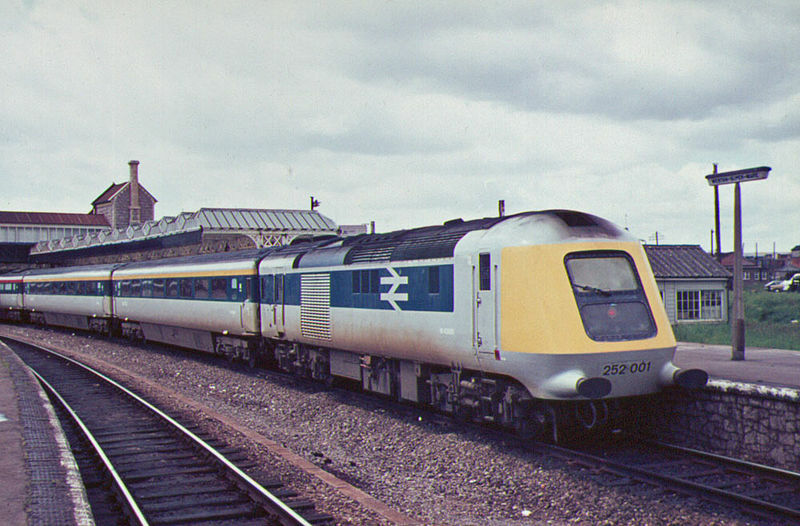 The go-ahead for production happened pretty quickly after that and the first sets of power cars and Mark III coaches started replacing the expresses on the Great Western Mainline in 1977, these were the Class 253. Two years later the second production run, which had slightly uprated engines and the guards van added, started taking over on the East Coast Mainline, these were the Class 254. The rest is history. As for the APT, the project continued with the first few prototype sets of power cars and coaches being rolled out in 1979. Unfortunately, due to political pressure they were forced into passenger service almost immediately and before they’d been used for the purpose they were designed, testing and refining the systems, especially the tilting mechanism which had been redesigned from the ground up to be failsafe, unlike the APT-E’s. This combined with a disastrous P.R. folly of a launch involving plying journalists with as much booze as they could drink and pandering to a minor celebrity (Isla St.Clair) made for a media storm and a political backlash the project never recovered from. (At the time the £1m “wasted” on the APT project was declared a scandal. The French would spend this much on 1km of TGV track in the late 1970s!) Soon after all the bugs in the APT trains and tilting systems had been sorted out in 1985, the trains were withdrawn from service and the patents sold to foreign companies, such as the one which went on to build the Pendolino trains for the West Coast Mainline.